"I love making art because it can be a way to exist in the moment. To be present." Called by Robert Ito of Los Angeles Magazine "The greatest West L.A.-based zine about Asian pop culture that isn't named Giant Robot: Drunken Master, the work of writer-illustrator-martial artist Kiyoshi Nakazawa, is raw as fugu and packs the same lip-tingling thrills. past issues have included a manga series about a mixed-martial-arts fighter; the latest edition features a talking narwhal and a photo roundup of some of the most gruesome yet strangely beautiful cauliflower ears in grappling history. Published erratically and available at all Giant Robot outlets." Kiyoshi Nakazawa has been putting out DM for close to two decades. 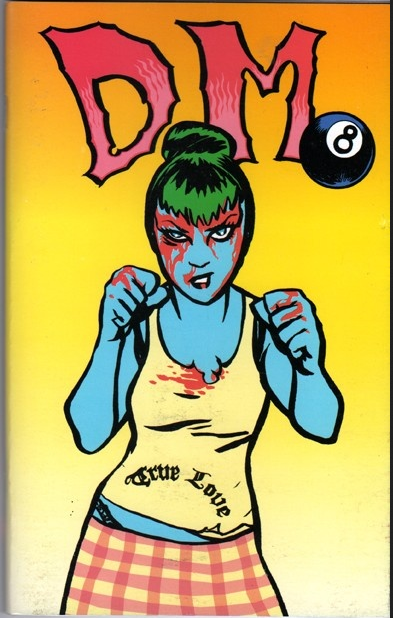 Kiyoshi Nakazawa is an artist, illustrator, and creator of the famed underground Los Angeles ‘zine Drunken Master. An alumnus of Pasadena City College, Kiyoshi attended Art Center College of Design in Pasadena with a BFA in fine arts. He has worked for Mattel, LA Weekly, Dark Horse Comics, Giant Robot Magazine, and Gorsky Press. His art shows and exhibitions have been seen in New York, San Francisco, and Los Angeles, and he is a regular at the San Diego Comic Con. This interview also appears in the Spring 2017 Print Issue of Inscape Magazine. Kevin: Thanks for talking with me! As PCC alumnus, could you give our students a bit of info about your time here at PCC? What were some of your fondest experiences? Kiyoshi: It was a very exciting time for me when I went to Pasadena City College! I was first learning about the big bad world on my own and I was no longer a medium sized fish in a small pond. I became a tiny fish in a huge ocean when I started attending PCC. I grew up in Half Moon Bay, CA, up north, and growing up in a small town, I thought I was different and artsy and original, but when I moved to the Los Angeles and I started taking classes, I quickly realized I was nothing special. My new classmates were much more bizarre and eccentric and original than I was. It was a great time! I met so many creative and interesting people here, many of whom were much more “art smart” and “street savvy” than young me. Kevin: Who were some of your influences at PCC? Kiyoshi: My favorite teachers were probably Ben Sakoguchi and Phil Cornelius, I just read that Phil passed away last year. RIP, Phil. He was a great teacher. Kevin: Lets talk about your art. You are both a fine artist and you do illustration, mixed media, and comics. I noticed that you use references from comic books in your art. Who are some of your favorite Comic Book artists? Kiyoshi: Some of the comic artists I reference are Tetsuo Hara, Otomo Katsuhiro, Jack Kirby, John Buscema, Joe Kubert, Brendan McCarthy, and many many more. It's always changing depending on what I am looking at and what I am working on at the time. Mostly I love the late 60's and 70's American comics and the 80's Japanese manga. Kevin: You’ve worked as a freelance artist for Dark Horse comics. Can you tell me a bit about what you do? Kiyoshi: I worked on a very cool collaboration project between the film director Spike Lee and Dark Horse called Colors In Black. I was given a lot of freedom to write and illustrate my own short story as part of that collaboration and it was one of my first published jobs. Many of my friends who also worked on the same book have gone on to continue making comics and working in animation. Kevin: Your work seems very cinematic and certainly would be great for animated film and television. Is that something you’d ever be interested in working on in the future? Kiyoshi: Sure, why not? I agree that many of my comics could be adapted to screen or TV. I have had loose discussions about it with a variety of people, but you know, there’s the green monster to deal with – budgets. Kevin: I really enjoy the sort of “Gonzo” vibe in your artwork. What kind of paint do you use for your fine art? Kiyoshi: Ha ha! I love that I can’t figure out what the ‘gonzo vibe’ has to do with what kind of paint I use! This makes this question more gonzo than my art! I love it. I use many different types of media/paint in my projects. I use oils, acrylic, water color, ink, spray paint and digital. All’s fair as long as it serves the work. Kevin: Do you have a favorite tool you use as an artist? Kiyoshi: My favorite crow quill is the Hunt 22B Extra Fine. If I want more swing in my line I’ll use the Hunt 56 quill. I also have a favorite sumi brush that gives me a nice dirty broken line because it’s so old and worn out. I never tell my tools that I have a favorite. They are all equal in my eyes and I don’t want any one tool to feel ignored. Kevin: What are some of the mediums you’re working in now? Kiyoshi: Right now it’s mostly ink on paper, then scanned, then digitally cleaned up and colored, but I work in mixed media so that means I work on wood panels, canvas and paper—really, anything that works. I use lots of inks and acrylic. Lots of colored pencils. I’ve made sculptural pieces that were covered in human hair. I’ve used food products such as rice and seaweed. I like to keep exploring. Kevin: You have this very gritty and raw LA underground style to your work. What are some of the inspirations behind your creations? Kiyoshi: It really depends. I’m inspired by the need for survival. I’m inspired by my two daughters and their wonderful ‘kid’ logic. I’m inspired by the need to connect with people through visual arts. I’m inspired by wonderful miscommunications. I’m inspired by how brief our lives are. This all finds its way into my work. Kevin: How did you come to collaborate with UFC’s Heavyweight, Josh Barnett? Kiyoshi: Josh and I had a mutual friend, Jay Tan, who introduced us. Josh is a huge comics, gaming, anime, sci-fi/fantasy nerd. The World’s Toughest Otaku as he is known. He saw my work at Comic-Con and we met soon after that. Working with him is great! Once while doing a signing at Comic-Con we did a spontaneous pro wrestling match! Actually, there are a few good stories involving other spontaneous pro-wrestling matches in public locations. Unsanctioned-pins-count-anywhere type stuff. The UFC walk-out t-shirt we collaborated on together was definitely a hi-point in work recognition for me. Josh and I don’t have any current project plans, but we have talked about doing a comics project together. I just did a piece recently to congratulate him on his latest UFC win over Andrei Arlovski in Belgium! Kevin: How did you come about working with the aquabats? I met Eagle “Bones” Falconhawk of The Aquabats through my friends in another band, Demander. Eagle liked my work and that lead to me doing the Aquabats poster. It was very fun stuff and those guys put on a very entertaining show! Kevin: You’ve got a lot of music referenced on your site. Do you play any music while you work? Who do you love to listen to the most? Kiyoshi: Too many to list! Iggy and The Stooges, The Sonics, Iron Maiden, The Immortal Lee County Killers, Toys That Kill, The Ramones, Misfits, Johnny Cash, Bolt Thrower, Buzzcocks, The Damned, Goatwhore, Gojira, Young Offenders, Hex Dispensers, The 5.6.7.8’s, Guitar Wolf, Fugazi, Minor Threat, Bad Brains, Black Flag, Van Halen, Judas Priest, Black Sabbath, Twisted Sister, Toxic Holocaust, Thee Michelle Gun Elephant, Thee Headcoats, The Shangri-Las, The Rolling Stones, AC/DC, Run DMC, Eric B and Rakim etc etc. I love drawing and inking to music but I don’t listen to music with lyrics when I write because it’s distracting. Kevin: What do you like best about being an artist? Kiyoshi: I love making art because it can be a way to exist in the moment. To be present. Kevin: Was there ever a time you wanted to do something else? Kiyoshi: There were plenty of other times when I did do something else but that was because I had to work and make money, not because I wanted to pursue anything else except art. If there ever was, I can’t recall any at this time. I probably entertained fantasies of being a pro fighter when I was younger, though. Kevin: What advice would you give to student artists? Kiyoshi: My advice would be to study art as a whole (creative writing, fine art, sculpture – all of them!) and to not get fixated on just the one angle that you think you want to do, like comics or animation. How a poet expresses word economy might inform how an artist solves a drawing problem. How a ceramicist expresses form might inspire how an artist expresses movement in an animated sequence. How a photographer documents the facts can inspire how you spin fiction. My big advice is to always be a student. That’s what I learned at PCC – lifelong learning. Special Thanks to Kiyoshi Nakazawa for his logo-header design for Inscape. 2017.